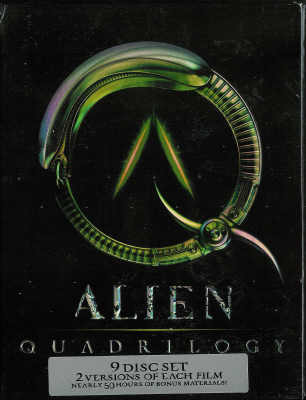 Experience the terror as never before with all four Alien movies -- plus four exciting alternate versions -- and nearly 50 HOURS of all-new material created exclusively for this 9-disc DVD Collector's Edition! Disc 2: 9 New In-Depth Featurettes, Deleted and Extended Scenes, Sigourney Weaver Screen Test & Much More! Disc 3: 1986 Theatrical Version with Audio Commentary, 1991 Special Edition with Audio Commentary, Widescreen. Disc 4: 11 New In-Depth Featurettes, Original Treatment by James Cameron, Multi-Angle Animatic to Final Scene Study & Much More! Disc 5: 1992 Theatrical Version with Audio Commentary, 2003 Special Edition with Audio Commentary, Widescreen. Disc 6: 11 New In-Depth Featurettes, E.E.V. Scan (Multi-Angle Study), Storyboards, Still Galleries & Much More! Disc 7: 1997 Theatrical Version with Audio Commentary, 2003 Special Edition with Audio Commentary, Widescreen with 5.1 DTS Audio. Disc 8: 12 New In-Depth Featurettes, First Draft Screenplay by Joss Whedon, Multi-Angle Rehearsals, Still Galleries & Much More! Disc 9: New "Alien Evolution" Documentary, Exclusive Ridley Scott Q&A, Laserdisc Archives, DVD-ROM Content & Much More!